In a large bowl or bowl of a stand mixer fixed with paddle attachment, whisk yeast with 1/4 cup warm water (about 110°F). Let stand 5 minutes. Stir in milk, food coloring, cocoa powder, sugar, egg, oil and salt. Stir in 1 cup flour, then replace paddle attachment with dough hook. Add enough remaining flour until dough pulls away from sides of the bowl (you may not use all the flour). Increase speed to medium and knead 5 minutes until you have a smooth, elastic dough (you can also knead by hand on a lightly floured surface for 10 minutes). Shape dough into a ball and place in a large, lightly greased bowl. Cover with plastic wrap and let rise until doubled, about 1 to 1 1/2 hours. Punch down risen dough and place on a lightly floured surface. Cover and let rest 10 minutes. Meanwhile, grease a 13-by-9-inch baking pan and set aside. In a small bowl, whisk together sugar, brown sugar and cocoa powder. Roll out dough into a 12-by-8-inch rectangle. Brush with melted butter. Sprinkle evenly with sugar-cocoa mixture. Roll up dough tightly from the long end, pinching seam to seal. Using a sharp knife, cut log into 12 equal slices and place rolls evenly in prepared pan. Cover and let rise until doubled, about 45 minutes. Preheat oven to 350°F. Uncover risen rolls and bake 20-25 minutes or until puffed and golden brown. In the meantime, make glaze: Using electric mixer, beat glaze ingredients until smooth. Remove rolls from oven and let cool 5 minutes before spreading glaze on top. Serve warm. I’m wearing a sweatshirt as I write this post. I have goosebumps on my arms and legs. The leaves outside are threatening to change colors and there’s dew on the ground. DEW, people. Do you know what this means? It means I’m going to need a hearty and delicious breakfast to get me up and at ‘em during this rapid transition to the cooler months. 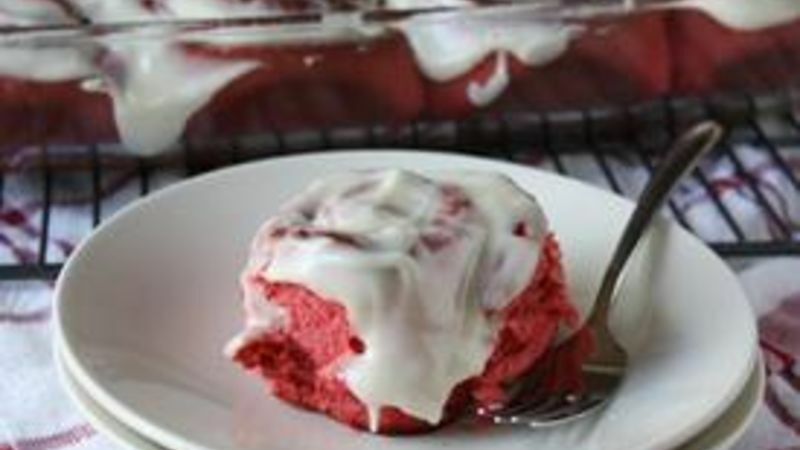 Whether you need a little boost before putting on your backpack and heading off to the school bus or something to help you get amped for the work day, these Red Velvet Rolls are so good, you won’t be able to wait to start your morning. I’m serious! Just one whiff of these ooey-gooey, cream cheese-glazed, chocolatey and warm breakfast rolls and you’ll be a morning person in no time (no worries: You can take a nap after breakfast). First, make the dough, shape it into a ball and place it in a lightly greased bowl for the first rise. The dough is dyed red and flavored with cocoa powder for a classic red velvet taste that’s not overpowering, but definitely adds a little something to these rolls. When the dough has risen, punch it down and let it rest for 10 minutes. You can tell when dough has doubled in size not only by looking at it, but also when the indentation of two fingers pressed into the top of the dough doesn’t bounce back. Roll out the dough into a rectangle and brush lightly with melted butter. Then, sprinkle on a mixture of sugar, brown sugar and cocoa powder (the trifecta of tastiness, if you ask me). Then slice it into rolls and place them, evenly spaced, into a prepared baking pan. Then bake until golden brown and, well, fully puffy. Meanwhile, make the delicious cream cheese glaze. Let the baked rolls cool for a few minutes then spread on the glaze. Commence the salivating. Good thing you have to wait only 0.3 seconds to dig into these warm, soft and sweet rolls. Just check out that ooey gooey chocolatey-ness. If this can’t get you out of bed in the morning, I suggest you go into hibernation all winter. Though you’ll miss out on breakfasts like this if you do!